A PersonalSign Digital Certificate is a Digital ID issued to an entity (i.e. individual or a department) that helps to prove that entity’s identity. The Digital ID binds an individual’s verified identity (typically including the name, company name, and email address of the Digital ID owner) to a unique cryptographic credential. PersonalSign Certificates identify, prove and contain different levels of information which are defined as classes. Each class represents the level of identity verification from simple email verification to full identity assurance. PersonalSign Certificates allow individuals and organizations to represent their digital identities through the use of digital signatures in many applications, from secure email to two factor authentication, and document signing. 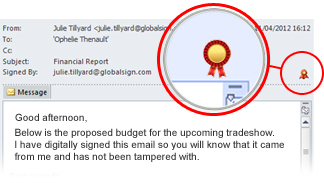 GlobalSign PersonalSign Certificates use S/MIME technology to allow users to digitally sign and encrypt email. 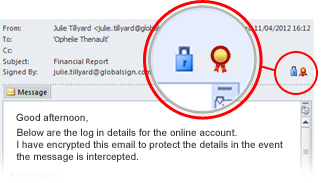 Secure Email is achieved using GlobalSign's Digital Certificate solution called PersonalSign. PersonalSign Certificates are cryptographic signing certificates that bind your verified, physical identity to the certificate so recipients of email messages can verify that the email actually came from you.